You may think about to create an online shopping cart or an online catalogue to display your products and features. And you want to update the product detail, the specifications, or the product pictures by yourself in the future. To create and develop a CMS based website is the best choice. We help you on the development and walk you through and train you to maintain the web pages. 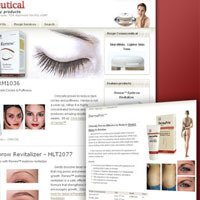 More over, this CMS based website is optimized with search engines. The url names, title tag, html coding are optimized with keywords. As you should know, search engine optimization is everything to be keyword relevant. Since this is an online catalogue website, to organized all the 50 products for the web site, we categorized them into beauty and health industry. 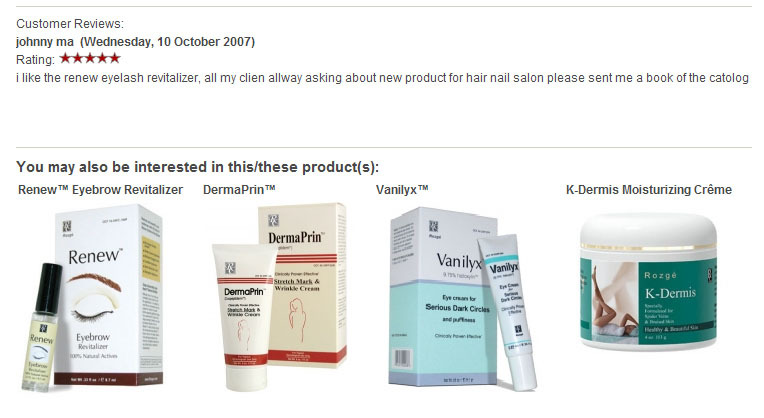 There are Adult Care, Body Care, Breast Care, Eye Care, Hair Care, Nail Care, Skin Care and Diet Easy Weight Loss. Each product page links to 4 other items at the bottom listed as “you may also be interested in this/these product(s):” (as the screenshot on the right). 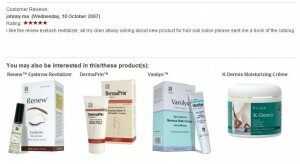 All the products are listed as an online catalogue, and could be released to cooperate with on-line shopping cart. 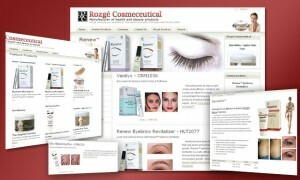 This rozge website is designed and published by end of September 2007.